Hoysalas, the true masters of Architecture are known for their magnificent and intricate carvings. They have always managed to include an unique feature in their temple architecture. A quite intriguing and striking feature seen at one of their temples is the "Garuda Lenka" pillar. 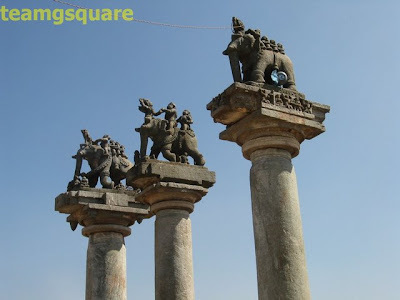 Three in number and rising up to about 15 feet, these pillars were erected during the reign of the Hoysala Kings, Ballala-I and Narashima-III during the 11th century AD. 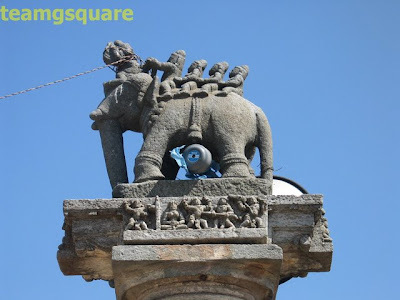 This was done in memory of the heroes who voluntarily sacrificed their lives for the well being of the kings and prosperity and fortune of the Hoysala kingdom. Garuda, a large mythical bird resembling an eagle ( and Lord Vishnu's vahana or vehicle ) also represents an ardent devotee or a servant who was ever ready to sacrifice his life in order to defend the king. Lenka is a word synonymous to Garuda while Lenkiti is the female counterpart. The pillars seem to depict the king and queen traveling along with their devotees (lenka -lenkiti) on an elephant. 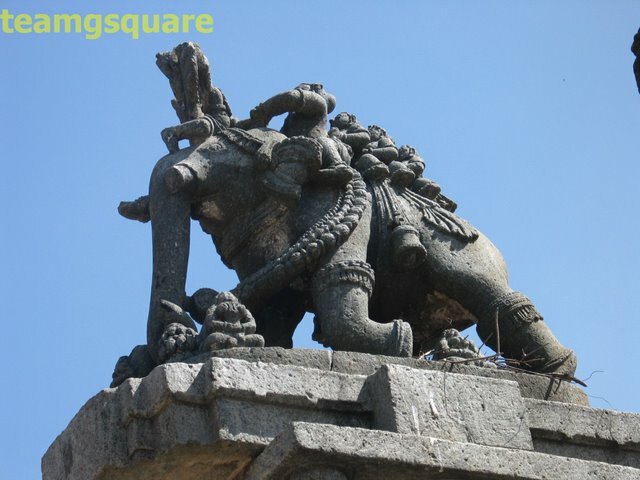 The garuda is shown to be kneeling on the elephant's head and facing the king while his hand is clasped firmly with the king's, a gesture that probably denotes the respect commanded by the king and the king's desire of achieving the supreme quality of Garuda while the tightly gripped hands could be a token of appreciation by the king for the willingness to sacrifice their lives. 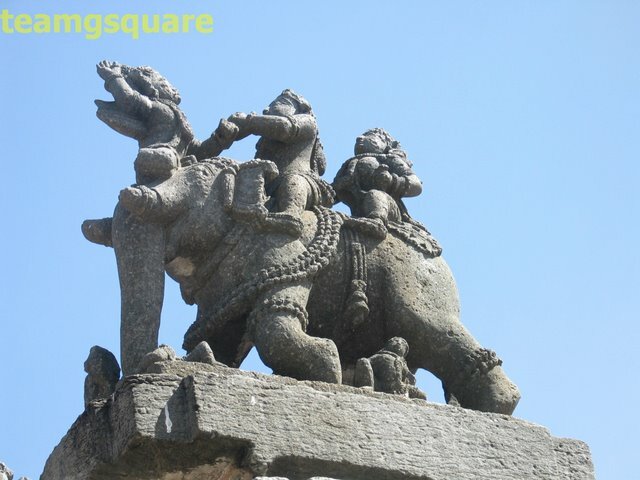 Our guess is that the central pillar depicts the king and queen along with the Garuda while the others include the Lenka and Lenkiti's, though we are unsure of the order of men seated so. Oh, yes! 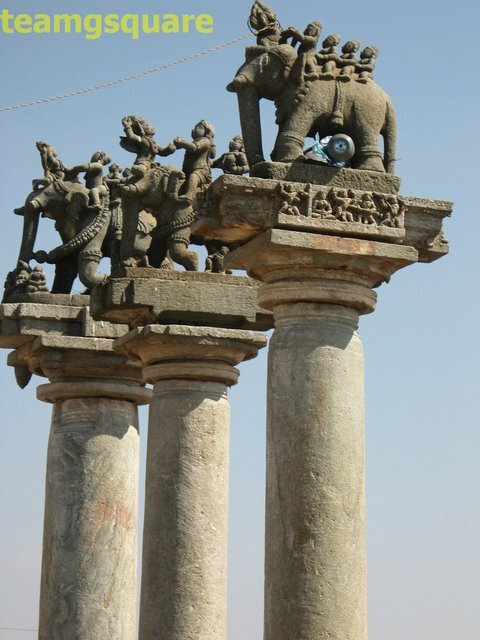 I can only repeat what Arti has written -- such magnificent architecture and such breathtaking carvings on the pillars! Your captures are superb!! Hope you have a great weekend! wow!! this is absolutely fantastic! never seen or even heard of anything like this! there are hero stones in memory of warriors who laid down their lives, but garudas to commemorate such courageous ppl is a really great concept! which temple are these in? would love to go someday! I am unable to guess where this could be. 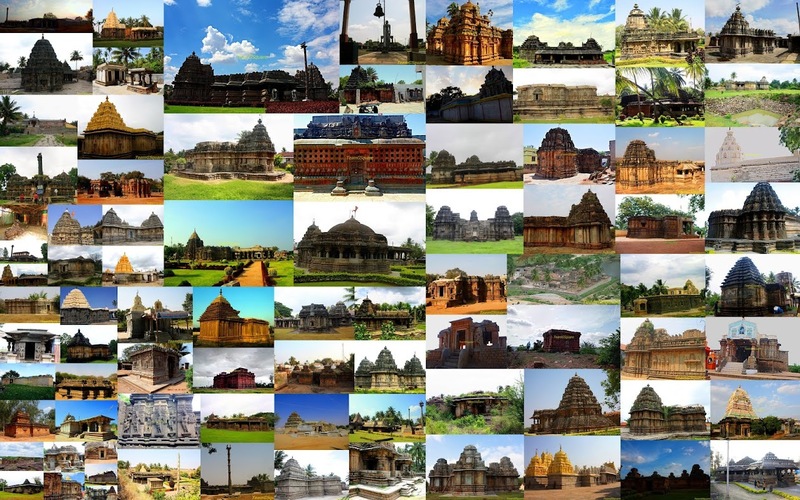 Hoysala? Seeing something like this for the first time...Shall wait for the upcoming posts.. The pillars and their carvings are beautiful. The fact that they have survived since the 11th century AD is amazing. I also love the elephant statues and figures. Your photos are lovely! Amazing craftsmanship. 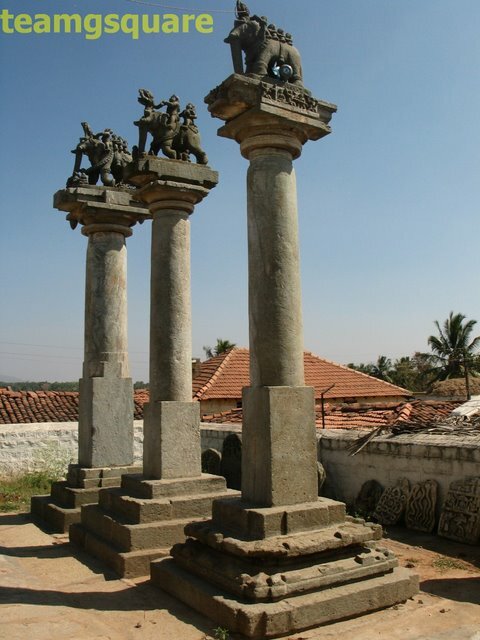 This look like a temple in South Canara region by the surroundings. Waiting for the details in the next post.